It is hard not to fall in love with the all-sensory feast that is Provence. The heady scent of lavender, rose and jasmine, that envelops Grasse, perfume capital of the world. The gentle sound of the beach that lures you to bathe in the soothing sunshine along the French Riviera. The aromatic flavour of fresh seafood at a small, yet lively, fishing village near Marseille. The picturesque markets that boast local produce that burst in seasonal taste and fragrance. The sweeping landscapes, majestic fields, orchards and vineyards, that embrace you along your journey. It is no surprise when I recount my trips to France – and travels around the regional areas – that Provence has featured most prominently. From Avignon in the west to Nice in the east, and passing through a land of contrasting terrain in between, for me, it was love at first sight. Back home, it is fruitless not to dream of returning to this spectacular part of the world. But until then, I have my sun-drenched tarte aux abricots to warm me with memories. Preheat the oven to 375 degrees F. Roll the dough into a 12-inch diameter circle that is about 1/4-inch thick. Transfer the dough to a 10-inch tart pan by rolling the dough around the rolling pin. Line the tart pan with the dough. Dock the dough and set aside. Make the almond cream. 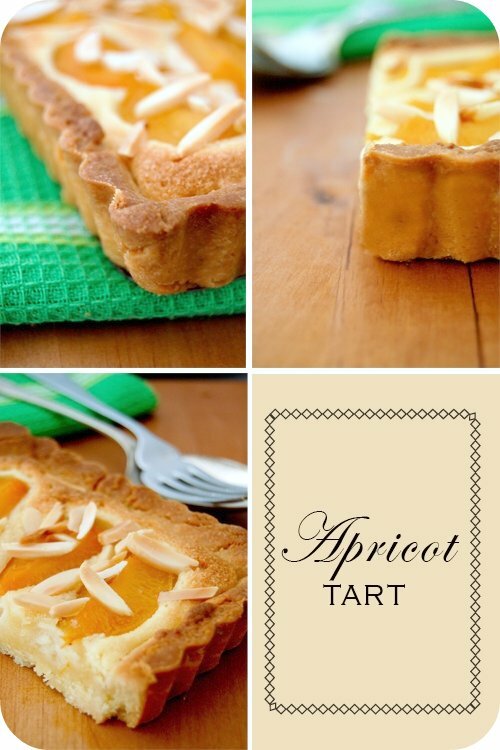 Spread a layer of almond cream inside the tart. Pit and quarter the fresh apricots. Arrange them on top of the almond cream by standing them on end. Sprinkle slivered almonds on top of the tart and bake for about 40 minutes. Dust with confectioners’ sugar. The problem with coming to your blog is that it always (every single time!) makes me hungry! I think you’ve got magical powers – this looks delicious! Mm that looks delicious. Your crust is so perfect! Your descriptions make me want to go for a French holiday right now! Gorgeous! That tart looks wonderful! I have always loved the Provence region in France. YOu really took me away there! Just wish I really had a piece of the tart though! Looks great! After your description, I think I’ll definitely have to add Provence to my holiday next year. Sounds wonderful and the tart looks delicious. Mmmm, and what delicious memories they are! Another beauty, another divine treat – and another fabulous story to go with. I hope you get back to Provence soon – just imagine how much more sweet inspiration you will find there. And how much we, your readers, will benefit from that. More temptations and more recipes to try. Merci ! What wonderful descriptions Julia. I’ve never been to France but every time I visit your blog this month I seem to get itchy feet! Beautiful tart as well – isn’t it great that stone fruit season is finally here? Yay! I simply love tarts. Wish I could have a slice with my coffee right now…that looks mouthwatering! Oh my..your photos..JacquesT.. the reminder of Provence..and could it be Cassis your charming fishing town I loved at first sight?A lovely post.. dreamy..yummy and full of memories for me.We are already dreaming of returning to Provence. When you describe these places, I practically feel like I’m breathing in the fresh air. Perfumed with apricots and almonds, of course. Thank you for this transporting moment. I would love to visit France one day – I would love to try all the delicious food. I am attending a tart making class on Thursday – If I can make a tart half as pretty as yours I would be really happy! Thanks for the inspiration – I will be going to the class with your tart in mind!